Hellenic Petroleum operates three refineries in Greece with a total capacity of 341kbd, and has sizeable marketing (domestic and international) and petrochemicals divisions. Hellenic Petroleum (ELPE) owns three refineries (accounting for 65% of total Greek refinery output), while having a substantial marketing and chemicals presence. Although we believe the European refining market to be challenging in the long term, short-term regulation changes (on sulphur in 2020) should support demand for products from complex, middle distillate-focused refineries like Hellenic’s. 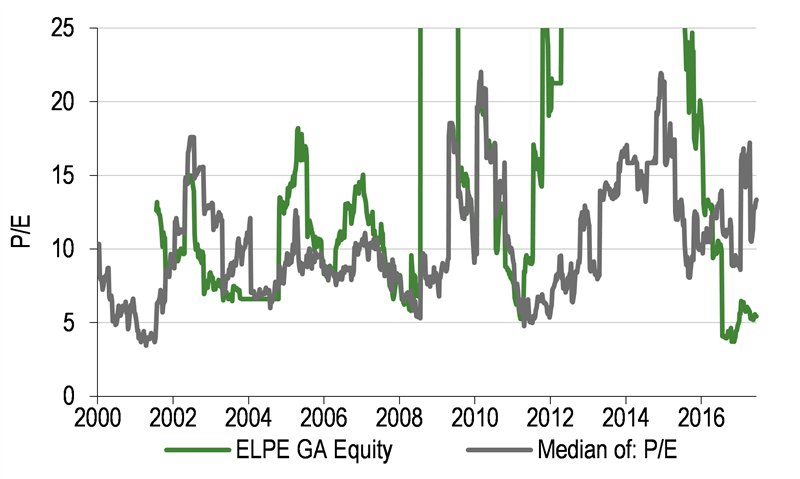 The cyclical macro environment will likely present challenges but ELPE has a strong balance sheet and should generate free cash flow in the coming years, which may be usefully deployed. We use a mix of 2018e P/E, EV/EBITDA and a longer-term DCF approach to value ELPE at €9.3/share, representing c 9% upside to the current share price. Note: *Adjusted numbers account for inventory movements and other specials. ELPE’s three refineries provide the bulk of the company’s EBIT (70% since 2012), but are more volatile in earnings than the other two main segments. Marketing provides steady returns from the Southern Mediterranean while its chemical division supplies much of Greek and Mediterranean polypropylene demand. The refineries have gone through major upgrades in the last decade and we do not expect further significant projects in the near term. 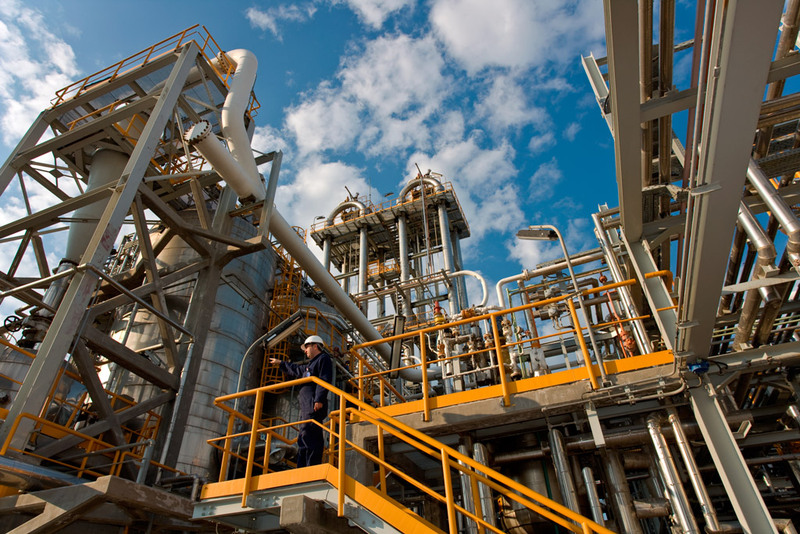 European refining will likely face continued challenges in coming years as demand falls and refinery systems elsewhere (Asia/US) hold structural advantages. To offset this, changing regulations should put complex, middle distillate-orientated refineries such as ELPE’s in a good position to export these products globally. The marketing division is a strong business and the company could look to add to its exposure to this relatively low-capital, high-return business in emerging markets. We also note continued uncertainty over the Greek economy and progress of privatisation, which could affect investors, given the state’s 35% holding. No new large projects are planned in the next few years, implying that significant free cash flow generation may be possible – it is up to the management to best decide how to deploy this. Paying down debt, reinvestment into growth opportunities or an increase in dividend payments are all possible. We use a variety of approaches, examining long-term trends and multiples to focus more on fundamental value and avoid focusing too much on next quarter earnings. Using a blend of P/E, EV/EBITDA and DCF methods results in a fair value of €9.3/share, which would imply a prospective dividend yield of 4.1%. Hellenic Petroleum offers investors exposure to competitive refinery assets in the Mediterranean that should deliver consistently strong cash flows and dividends. After significant investment in 2012, the integrated refinery portfolio is well placed to benefit from upcoming growth opportunities (from fuel specification changes in 2020 and from any recovery in the Greek economy given its dominant market presence), while its output (>50% of products are exported), complexity and location (close to Middle Eastern crude supplies and exposure to markets in the Southern Mediterranean) should continue to produce marked premiums to benchmark refining margins and protect earnings to a greater extent in any downturn. Longer term, the strength of the balance sheet, strong cash flow generation (we estimate 2018 FCF yield of nearly 20%) and low maintenance capex (no major projects are envisaged at the refineries at this time) give the management the flexibility to look at growth opportunities elsewhere or return capital to shareholders. Other major segments such as marketing and petrochemicals should deliver consistent cash flows while limited, judicious investment in domestic Greek E&P opportunities may produce outsized returns in time. Divestment of non-core assets (including the ongoing sales process of an associate gas business) will also contribute. Hellenic Petroleum operates three refineries in Greece with a total capacity of 341kbd, and has sizeable marketing (domestic and international) and petrochemicals divisions. Two of the refineries (Aspropyrgos and Εlefsina) are complex, integrated and provide significant flexibility of feedstocks/throughput. The third, Thessaloniki, is small and simple but houses Hellenic’s petrochemicals units, which have significant Greek and Mediterranean sales, and complements Hellenic’s refining system. Its marketing business is split into two: a domestic division supplies retail and wholesale customers (including bunkering and aviation customers), while the international business holds 274 petrol stations across Serbia, Montenegro, Bulgaria and Cyprus, providing stable earnings with high returns. Hellenic holds interests in a number of companies (held as associates) including two power and gas companies. As part of the Greek privatisation scheme, the company expects to finalise a sale of one of the largest associates in 2018. Finally, ELPE has limited invested capital in its Greek E&P business. No significant hydrocarbons have been discovered at this point, which is not surprising given the early-exploration stage of the portfolio. Hellenic Petroleum is listed in Athens and is 35% owned by the Greek state. There has been mention of a sell-off of the state stake as part of privatisation in the country, although there has been no recent news. However, advisers are in place and the next few months will bring increased clarity on the government’s intentions on its stake (held by the Hellenic Republic Asset Development Fund [HRADF]). Hellenic’s balance sheet is in good shape. Total gross debt of €2.6bn is partially offset by €850m of cash, leaving net debt of €1.8bn (end September 2017). Our estimated EBITDA in 2018 of €756m means net debt to EBITDA is 1.5x, vs the company’s target of 2-2.5x. We forecast free cash flows (pre-dividend and any asset sales) of €612m in 2017 and €558m in 2018. The refineries have undergone significant improvements in the last 10 years (with a notable programme in 2012 costing €1.6bn at Elefsina and a smaller-scale upgrade at Thessaloniki of €250m in 2011) and the company has no plans for further significant upgrades, leaving annual capex of €100-150m easily affordable at mid-cycle margins (we assume €140m per year on average). We therefore expect gross debt to continue to fall over time as the company generates free cash flow. The company currently has a prospective dividend yield of 4.1% (based on a dividend of €0.34/share). We have assigned a valuation of €9.3/share for Hellenic, using a blend of EV/EBITDA, P/E multiples and a longer-term DCF approach. We have also crosschecked these approaches with others that have relevance in a mature, dividend-paying industry such as refining. Free cash flow and dividend yield, dividend discount model and finally price to book metrics all produce a range of values similar to our modelling, which we have examined historically. 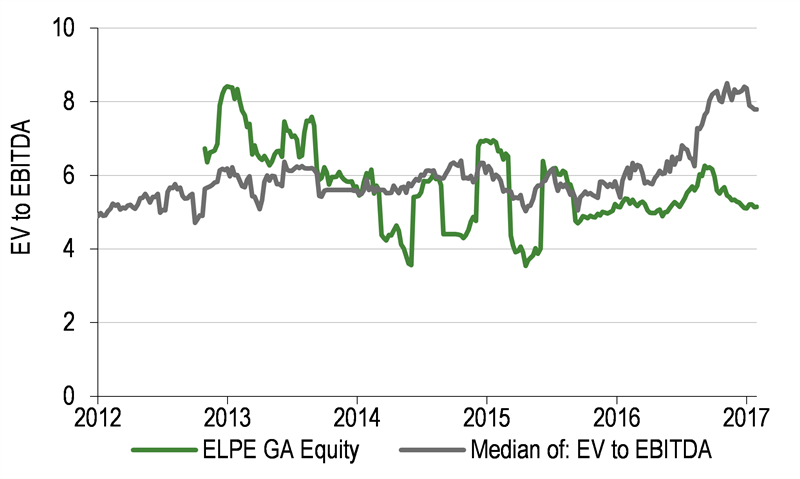 ELPE is currently trading at a slight premium to European peers (ex Neste) on 2018e EV/EBITDA (on 5.9x), but at a discount on P/E metrics (7.8x vs 9.5x peers). It has a strong prospective dividend yield of 4.1%. Our fair value indicates c 9% upside to the current share price. Refining has made up 70% of the company EBITDA over the last five years, and refining is a cyclical and highly operationally geared industry. Hellenic has seen material movements in its cash flows since 2000 as refining margins benefited from strong demand growth (2005-08) in the golden age of refining, which then fell in a period of poor margins (2009-14). Marketing produces far more stable earnings (and higher returns), which account for 10-15% of EBITDA (though highly seasonal). Refining margins averaged $10.6/bbl in 9M17 ($9.5/bbl in 2016, estimated $9.6/bbl in 2018); a $1/bbl increase (or decrease) over the course 2018 would see refining EBITDA rise (or fall) by c 18% (or about €100m), which equates to around 13% at group level. A barrel of crude oil is made up of a huge range of hydrocarbons, with varying length of hydrocarbon chains, structures and additional elements, with crude characteristics varying hugely by source. Refineries take crude oil and other “heavy” feedstocks (the longer a hydrocarbon chain, the “heavier” the substance), and convert these by a series of processes to a range of products. Simple processes (eg crude distillation) heat up the crude and separate out the components according to their boiling points, while more “complex” units in a refinery look to split apart these heavier molecules to produce smaller, “lighter” and more valuable products. Crude distillation unit (CDU) is the initial stage, whereby crude is heated and the constituents separated by distillation. Also referred to as atmospheric distillation units. Fluid catalytic cracking (FCC) – the feedstock is heated and kept under pressure while being passed over a (powdered) catalyst. This breaks the long-chain molecules into much shorter molecules. Hydrocracking is a common catalytic cracking process that adds hydrogen. The action of the hydrogen and catalyst breaks two carbon bonds, inserting the hydrogen. Visbreaking breaks bitumen/asphalt by thermal cracking (it does not include a catalyst). Catalytic reforming (CCR) converts very light, linear chain products into heavier (normally cyclical or aromatic) products. The process produces excess hydrogen that can then be fed into other processes (like a hydrocracker). Coking processes the heavy products from fluid distillation into coke – a solid consumed in power generation and in the production of anodes. 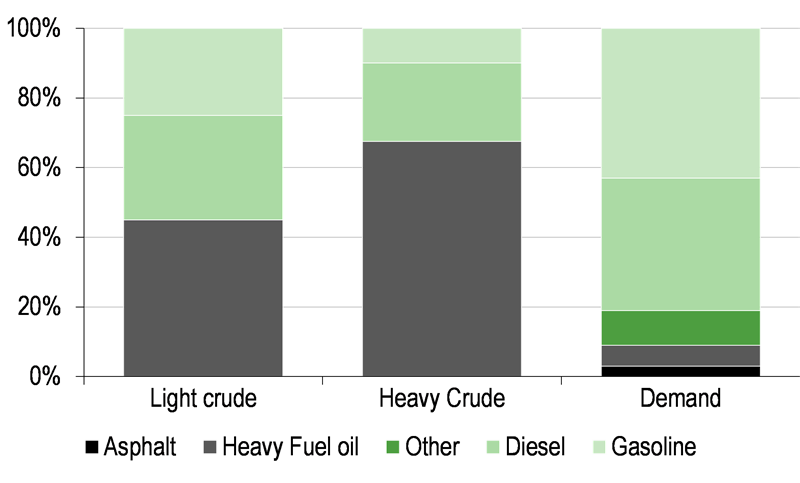 As a similar fuel to coal, use of coke is declining in developed markets and often exported (for example coke accounted for 19% of the US’s petroleum products in 2012, with most going to China and Asia). Each unit requires a large amount of energy (for instance a CDU heats crude to c 400°C). Importantly, the more complex the refinery, the more flexibility it has to move between the yields. The most common light products are gasoline, diesel and jet fuel, LPG and naphtha, while heavier components such as fuel oils are by-products. Source: Various. 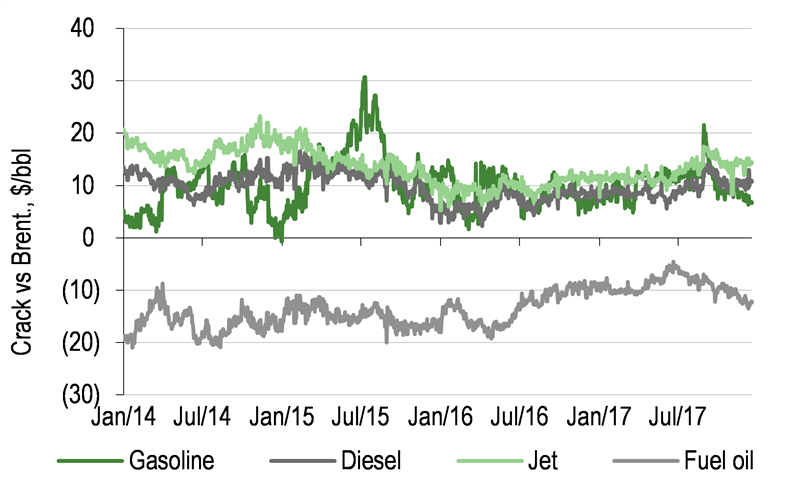 Note: The gasoline and diesel products in the demand column will be ultra-low in sulphur. As can be seen above, products tend to trade at premiums to the crude oil, while fuel oils trade at a discount. Refineries maximise their profits by increasing the yield of light products to heavy products, maintaining a “refining margin” that represents the profits from buying one barrel of crude and selling the products resulting from processing. The variety of crudes and refinery units that refineries contain mean that the resulting refining margins can see wide differentials. Source: IEA, Hellenic Petroleum, Neste, Saras, BP, Total. Note: The thicker lines are Hellenic’s refineries. Hellenic operates three refineries that together account for 341kbd capacity and 65% of the Greek refinery output. A capacity weighted Nelson complexity index of 9.3 gives an indication of the complex’s flexibility and ability to produce a high percentage of light products from every barrel. The refineries are linked, allowing better integration to best take advantage of their strengths of location, size, storage and complexity. The complex has a high degree of flexibility – since 2014 it has been able to flex its gasoline yield between 20-24% while middle distillates have been between 50-58% of yield (working at full capacity). Fuel oil yields are fairly low (10-13%) and there are no plans to undertake large projects to add further units to the complex at this time. The company has a large storage capacity (41.8mmbbl) and can take advantage of trading opportunities. Aspropyrgos refinery is the largest in Hellenic’s portfolio and is one of the most modern refineries in Europe (was built in 1958). Significant upgrades were completed in 1986 (residue conversion project, FCC, mild hydrocracker, visbreaker and CCR units), 1999 (capacity increased to 148kbd) and 2004 (upgrade of conversion units). From 2014, heat and power has been supplied by natural gas (rather than fuel oil), reducing costs and increasing flexibility. The result is a refinery able to produce high levels of gasoline. It is connected to Elefsina via pipeline. Elefsina is Hellenic’s most complex refinery and has a refining capacity of 100kbd. A €1.4bn upgrade in 2012 added a 39kbd hydrocracker, a 20kbd thermal cracking unit (flexicoker, which gasifies coke for internal heat and power generation and reduces the need to export/sell coke produced elsewhere in the refinery) and a vacuum distillation unit increasing the Solomon complexity to 13.9 from 1.5 (and the Nelson complexity to 11.3. Its large storage capacity (20.7mmbbl), coastal location and connections (to Aspropyrgos refinery and crude terminals at Pachi and Megara) make it a good trading and logistics hub. The refinery can take heavy, high sulphur crudes and products. As a result, its middle distillate yield is over 75%. Thessaloniki is the smallest and simplest refinery (hydroskimming) type and has storage capacity of 8.8mmbbl. It is the only refinery in Northern Greece (Aspropyrgos and Elefsina make up a southern Greek hub) and supplies both the domestic market and neighbouring countries. A 2011 upgrade renovated distillation units, increased storage capacity and added a 15kbd CCR unit. Thessaloniki also provides feedstock (including residues) to the Southern hub and reforms naphtha from Elefsina (to gasoline). Source: Edison Investment Research, various. Note: Grey bars are Hellenic’s refineries. The refineries are among the smaller end of the European refineries, but we note that the combination of the two more complex refineries (connected by pipeline) would put them towards the top of the group. Source: Hellenic Petroleum presentations. Note: ELPE’s refineries are in black, European independent peers in green. The larger grey point is the sum of the refinery capacities and weighted average complexity of the Aspropyrgos and Elefsina combination. This complexity and integration means that Hellenic’s refining margin compares well to its European listed peers, especially after the Elefsina 2012 upgrades. Source: Hellenic Petroleum releases. Note: Refining margins only, apart from Tupras and Motor Oil, which are company margins. Note that Motor Oil data are annual only. Source: IEA, Hellenic Petroleum, Edison Investment Research. Note: FY17 is estimated at this stage. 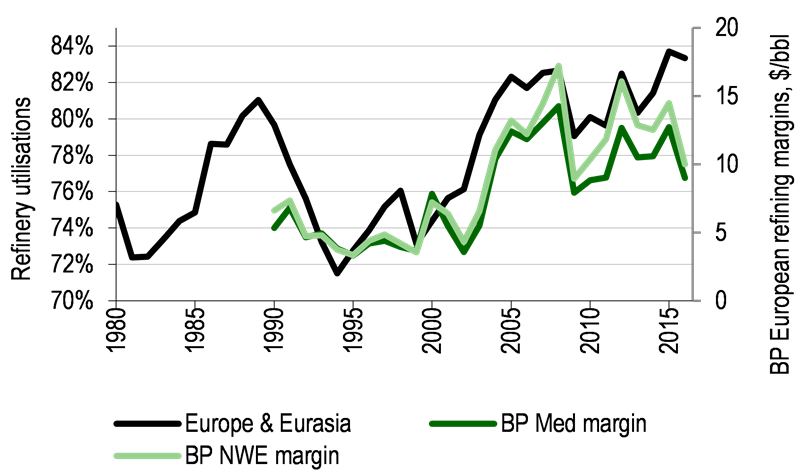 The investment at Elefsina in 2012 has seen notable improvements of Hellenic’s realised margins and EBITDA vs benchmarks. Adjusted EBITDA per barrel has improved by more than $1.0/bbl (comparing period 2009-12 vs 2013-17 averages), while benchmark refining margins in the same period have increased by $0.5/bbl, suggesting that the programme has boosted EBITDA materially. Despite a massive growth in renewables supply and gas supply, oil will continue to be a major and growing part of the energy mix .Global oil and products demand is forecast by BP to increase by 0.7% per year to 2035 (from 2015). As a result, refineries will continue to be needed and margins will need to be high enough to generate returns to incentivise these. However, this is a regionally diverse picture and strength in profits will follow those regions with continued demand growth and the lowest costs. As a result, we expect to see continued growth in refinery capacity and utilisations in Asia (subject to cycles) as China and India continue to drive demand growth. Europe will likely suffer the reverse, as demand continues to fall over time (BP sees liquids demand falling by just under 1% per year over 2015-35). Additionally, as a fully developed market, Europe suffers from having older, smaller and less complex/integrated refineries with high costs vs (new Middle Eastern and Asian) peers and often higher regulatory pressures. 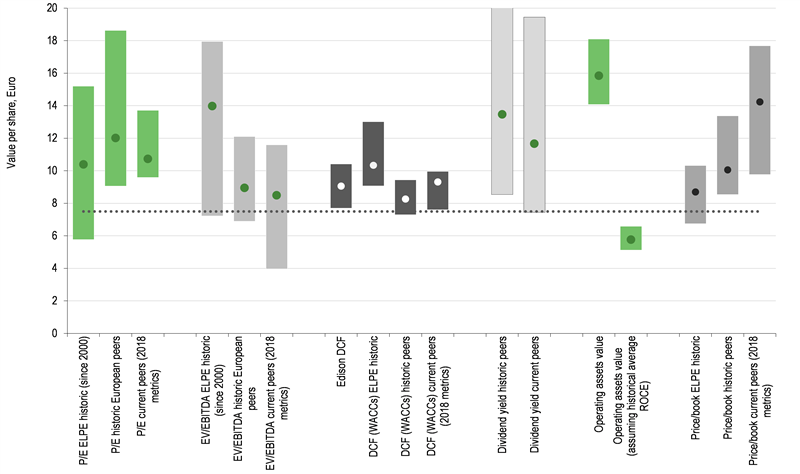 European refineries do not have access to shale oils (often traded at material discounts to Brent in recent years) or to the cheap (shale) gas that can help to significantly reduce costs. In 2015, ExxonMobil estimated that energy costs (as a percentage of total cash costs) were about 50% in 2000-08 for both US and European refineries, but by 2012 this had fallen to about 30% for US refineries (vs a slight increase in Europe). While European refineries were described as world class in terms of energy efficiency, higher energy costs were the difference. As demand slowly drains from these markets, refineries will increasingly lean on exporting excess products, incurring additional transport costs to Asian markets and lowering effective margins further. In this new environment, refineries will only prosper if they can take advantage of storage, trading, petrochemicals and integrated facilities. Refineries serving captive or special markets should do well. This will be a slow process though, with closures/rationalisations hindered by sovereign interests, union involvement and other factors. Source: BP, Edison Investment Research. 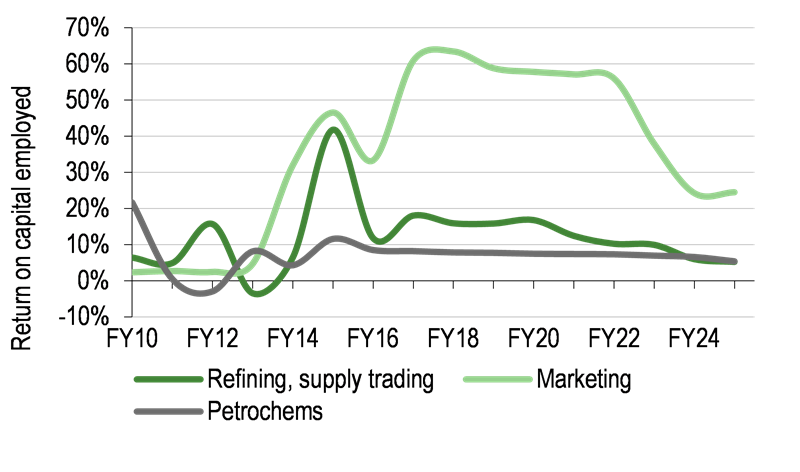 Note: Dashed line is utilisation if capacities remain the same and demand falls c 1% per year. The shale boom has reversed a long trend towards the development of heavier and heavier crudes. Exactly how much US shale production can grow (and for how long it can be sustained) is open to question, with well productivity increases slowing and capital markets that seem to have reduced the ease at which companies can raise equity. In the shorter term, global refinery additions are forecast to average around 1.2mb/d from 2017-20 (according to various industry sources), roughly in line with five-year average demand growth. As result, we see refining margins as remaining relatively firm for the next few years, albeit softer than in 2016 and 2017. Source: ELPE, Edison Investment Research Note: Q417 beyond are forecasts. January 2020 will see the introduction of new shipping and refining regulations, lowering the global maximum sulphur content on bunker fuel to 0.5% (from 3.5% currently) and potentially raising global distillate demand by around 3% (50m t/year) from 2019-20 according to industry observers. We believe that many participants are adopting a “wait and see” approach and have yet to make the necessary investments in full. This could well mean that low sulphur product margins will benefit in the intervening years and we model an increase in realised margins in 2019 onwards for Hellenic (fading after 2021) to account for this potential move. Hellenic holds a 50% market share of the petrochemicals market in Greece and benefits from integration with the refineries. The main products are polypropylene (derived propylene which is generated by the splitting of LPGs and naphtha cracking). Propylene produced in Aspropyrgos and processed at Thessaloniki), BOPP film, solvents and minerals. It produces more than 230k tons of product units per year. Around 65-75% of its products are exported to selected markets in the Mediterranean. The majority (c 85%) of the company output is polypropylene (PP), the price of which is well correlated to Brent Crude. This is not surprising given that PP is made from propylene, a by-product of the steam cracking of naphtha and LPGs (which come from crude oil). Hellenic’s petrochemical units have seen steady growth in EBITDA over the past five years, with relatively little volatility helped by structural improvements within Hellenic (including increasing propylene yield at Aspropyrgos and commercial optimisation within the portfolio). Without a dedicated supply/demand model, we forecast steady earnings in the near term, though a decline in margins over time as competition reduces returns in commodity chemicals. Chemicals make up only 10-15% of Hellenic’s EBITDA, so moves in margins in chemicals have a limited impact on group results. Returns on capital in marketing are typically strong, averaging over 30% in 2013-16, though they are market dependent, with Greek margins much lower than international (emerging) markets. Hellenic has a large presence in Greek’s downstream with a material position in wholesale and retail sales. It currently supplies 1,754 petrol stations in Greece under the BP and EKO brands. In wholesale, it has 15 bulk storage and terminals, 23 aircraft refuelling stations, two LPG bottling plants and a lubricants blending unit. Of its volumes sales in 9M17, 40% were retail, 12% jet and 24% bunker (shipping). Business is seasonal and peaks with incoming tourism in the summer, helped by supply contracts at airports and higher bunker sales. Source: Hellenic Petroleum, Edison Investment Research. Note: Numbers from Q417 are Edison estimates. Hellenic operates 274 petrol stations across Serbia, Montenegro, Bulgaria and Cyprus. Sales have been steady over recent years, averaging around 280ktons per quarter contributing over €40m EBITDA per year (since 2014). International marketing has had stronger margins (and has contributed more EBITDA over the last three years) than domestic operations. 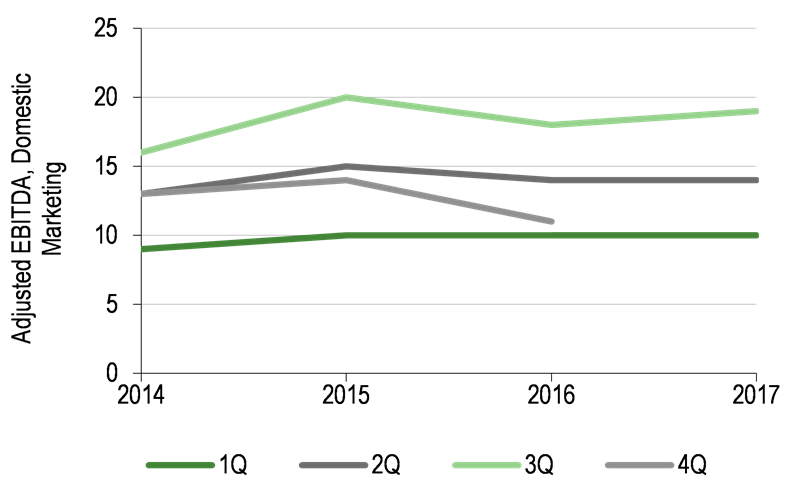 We forecast little change in overall marketing margins. 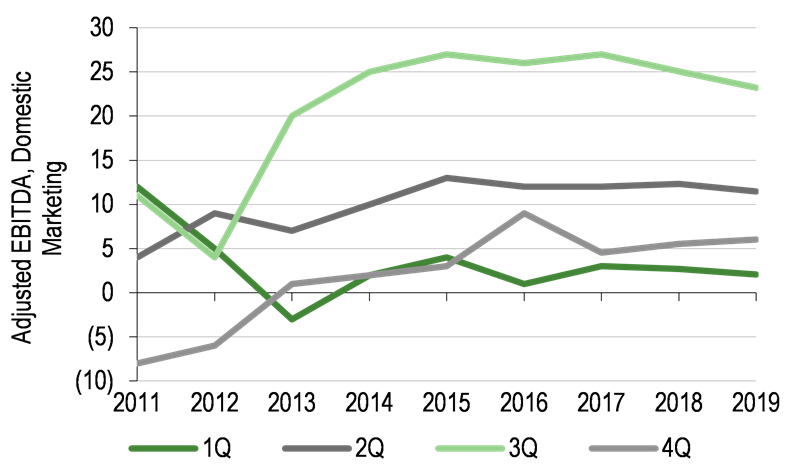 Retail margins are similar to Grupa Lotos and well above the results seen in Finland (Neste) and Italy (Saras). Developed markets typically have much lower margins than emerging ones, despite innovations such as attached mini-marts. 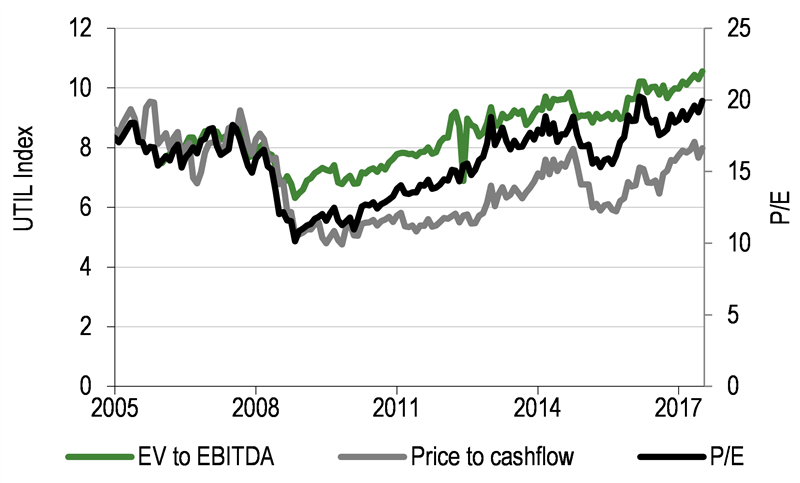 Overall, we see a marginal decline in domestic and international EBITDA over time, but still well above the cash generated over the 2010-14 period. We note that recovery in Greek markets and/or investment in international could see EBITDA improve. Source: Hellenic Petroleum release, Edison Investment Research Note: these businesses are different in their geographical placements, markets they occupy (wholesale vs retail mix for example) and maturity of markets. 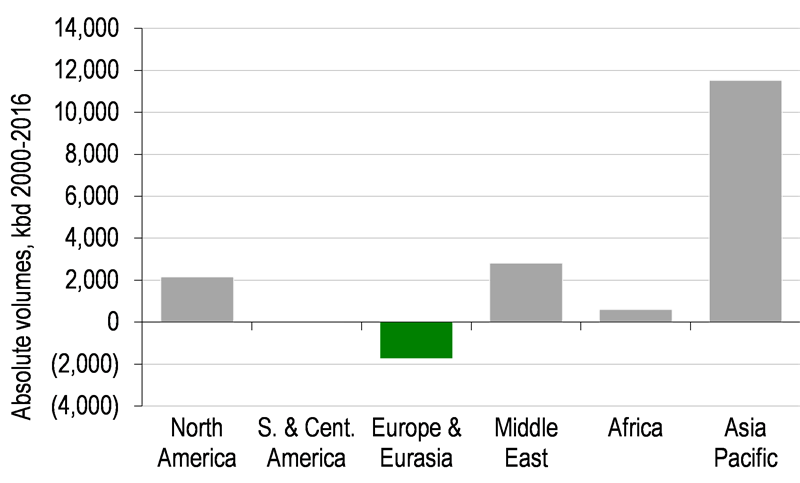 It is clear, however that Hellenic generates strong margins in its retail segment vs its peers. As part of a joint venture with Edison (Elpedison), Hellenic operates two combined cycle gas turbines (CCGTs) with a total capacity of 810MW (made up of 390MW CCGT in Thessaloniki and 420MW CCGT in Thisvi). Through the associates, Hellenic is also active in renewables, with a portfolio exceeding 200MW (with 17MW currently operating and the rest in development). In natural gas, ELPE owns a 35% interest in DEPA (the rest is owned by the Greek state under the HRADF), which manages and develops the national natural gas network (DESFA, a 100% subsidiary of DEPA). DEPA also owns 51% of local supply companies (EPA) and participates in international gas projects (LNG). The interest in DEPA will be privatised, with ELPE selling its stake in DESFA (as part of 66% of the company being sold). As reported in the Q3 results, DESFA is currently in the midst of a sales (privatisation) process. The company expects to get financial offers in by February 2018; we expect a conclusion in H218, although the sale process needs to be approved by an EGM. We note that a previous sales process in 2012 (since terminated) saw a binding offer of €400m for a 66% stake in DESFA signed in December 2013, implying a €212m value for Hellenic’s stake. Financial accounts of DESFA alone are not available (only DEPA as a whole), so we are not able to derive a sales metric. However, the net asset value held by ELPE in 2012 of DEPA (as a whole, including DESFA and other assets) was €598m and the carrying value was €237m. Additionally as of Q317, the company was carrying the investment at €659m, while the historical cost of investment of the DEPA group was €237m. The other associates lost €17m in 2016 (post tax income) and lost €12m in the first nine months of 2017. For valuation purposes, we could assume the value of DESFA has grown in line with the book value of DEPA as whole, so the €212m implied value in 2012 would have increased to €234m. However, this is open to substantial uncertainty, not least because utility multiples have moved since 2012 (see below) and the perception of Greek market risk has moved somewhat (as measured by bond yields). After a decade of international operations (including in Albania, Libya, Egypt and Montenegro), Hellenic has reduced its E&P activities to focus on (onshore and offshore) Greece. The company holds assets in the Patraikos Gulf and was also declared a “preferred bidder” for the offshore blocks 1, 2, and 10, as well as onshore blocks in Arta-Preveza and the NW Peloponnese. Onshore blocks (and offshore block 2) have had lease agreements signed. In November, the company, together with its partners Total (50%) and Edison (25%), signed a lease agreement and will start G&G activities in 2018. Until traps are identified and wells planned, we do not assign any value to the operations. We see refining earnings in 2018 falling from 2017 levels, but forecast a growth in margins in 2019 as the sulphur regulations start to take effect. We forecast a slight decrease in petrochemicals earnings but flat marketing EBITDA y-o-y. Chairman Efstathios Tsotsoros is a professor at the Panteion University in Economic Development and Social Transformation. He has extensive experience in management positions in public and private sectors as well as in local government. He has been director of PPC, board member and CEO of the Business Reconstruction Organization, Vice president and general manager of the Athens Regulatory Plan and Environmental Protection Organization, board member and CEO of various companies in the private sector and founder, chairman and CEO of the Broadcasting Group Alpha. He was also advisor to the minister of energy, to the Athens mayor and to the president of the Greek Technical Chamber and he has also occupied the post of the chairman of the National Committee of Programme Agreements and Development Contracts. CEO Grigorios Stergioulis is a trained chemical engineer and holds an MSc in advanced integrated design. He has worked at Hellenic Petroleum since 1984 in various roles including as coordinator of the Elefsina refinery upgrading project. He has published technical publications in matters of automation, production computing systems and production optimisation and advanced control systems. He is the author of the book The Oil Market in South East Europe, which was published by the South East Europe Energy Institute and the General Trade Union of Greece. He has participated in many conferences as a speaker. In May 2015 he was appointed CEO of Hellenic Petroleum SA. CFO and Deputy CEO Andreas Shiamishis holds an economics degree and is a fellow (FCA) member of the Institute of Chartered Accountants in England and Wales. His previous roles include positions at KPMG and Diageo. From 2000 to 2002 he worked as CFO at LEVENTIS Group and took over as chief financial and IT officer at Petrola Hellas in 2003. After the merger of Petrola Hellas with Hellenic Petroleum, in 2004 he took over as CFO. He is a member of the Hellenic Chamber and of the Corporate Finance Faculty of the ICAEW. Refining margins – along with all refineries, the major risk to earnings is volatility of refining margins. As a price taker, it can do little to mitigate in the short term. Longer-term improvements of the refineries are capital intensive and take many years. However, it will also benefit from increases in refinery margins. As we discuss in the report, we think margins in Europe will compress in the long term. Concentration risk – the bulk of Hellenic’s earnings are generated at the three refineries. Any incident that stops the refineries from operating (such as an unplanned outage) could have a material effect on cash flows. This is mitigated to some extent by the three separate sites and the other material businesses (not least marketing) and is particular advantage vs single refineries (such as Saras and Motor Oil). Oil price – an increase in the oil price could have a material effect on the refinery earnings and balance sheet. Increasing oil prices would produce positive inventory effect earnings for the refineries and marketing businesses while requiring greater cash to be locked up in working capital. Greek risk – Hellenic has significant export businesses and its production is entirely fungible for international markets. However, a fall in Greek demand or market sentiment towards the country may mean reduced sales and a greater risk premium applied to companies in Greece. These could have a detrimental effect on earnings and rating for Hellenic. The Greek economy is growing again but there is disagreement between the IMF and eurozone on what actions are required to continue on a path to greater stability. The incoming head of the eurozone (Mario Centeno) has stated that Greece needs to complete the current programme before any restructuring can occur, yet on 10 December Christine Lagarde said the debt needs to be restructured soon and hoped that it could be done early in 2018. This is clearly a fluid situation and Greece is not out of the danger zone yet. We also note the state ownership of 35% may be sold down over time as part Greek economic restructuring. Equally, we note that the Greek economy has a lot of potential to grow, and Hellenic Petroleum would be well placed to benefit from increased economic activity through the marketing, power and chemicals divisions. Increased tourism would help the refining and trading segment. FX rates – as we mention in the financials section, a move in the euro vs the US dollar could have a material impact on earnings. Refining is a US dollar business (margins are quoted in USD) and so lower costs in US terms (as costs are in Euros) have benefited earnings (and cushioned the poor refining environment in 2011-14). We calculate the average impact (2015-17) to have been around $85m on a pre-tax basis. Refining is a mature industry and exposed to cycles, which indicates that previous cycles should be instructive in analysis of valuing the companies. 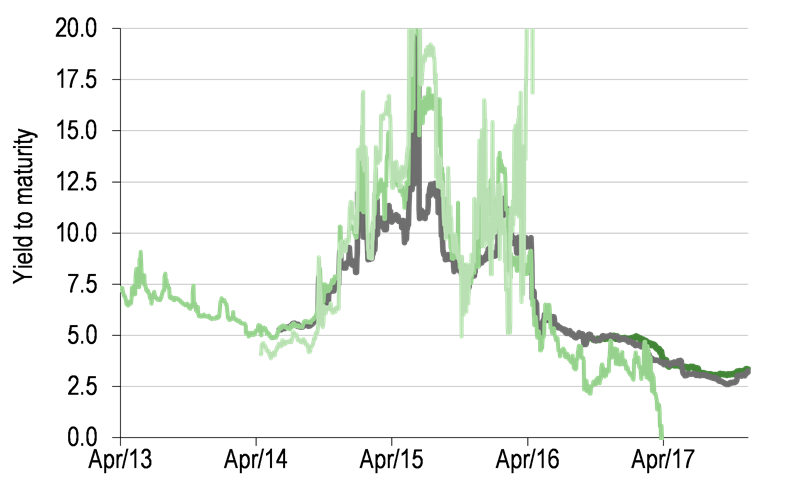 We have analysed a number of metrics since 2000 and look to use these as a guide to possible valuation for Hellenic, knowing that market sentiment changes over time. Traditionally, analysts and investors look at EV/EVBITDA and P/E multiples in refining, but our view on the longer-term decline of the refining industry and a move towards a more normalised (historical) returns on capital means we also look to DCF, price to book and other methods to help frame a longer-term view. These approaches produce a range of valuations from c €6/share to c €13/share per share, suggesting 30% downside to c55% upside. We settle on a blend of these to get to a value of €9.3/share based on a shorter-term P/E and EV/EBITDA metrics and a longer-term DCF valuation. We note the price/book ratios imply more notable upside. We also detail a number of other approaches – dividend yield and operating asset valuation (Gordon growth model). Source: Edison Investment Research, Bloomberg. Note: Colours represent different approaches. The ranges represent the quartiles of data, while the dots are the median. Source: Bloomberg, Edison Investment Research. Note: Prices as at 25 January 2018. Hellenic is trading below US/European peer averages on EV/EBITDA, and this gap has widened notably over the last 12 months. However, it is trading roughly in line with European peers, suggesting that investors are willing to pay more for lower-cost crude/energy supply (in the US) vs the structural challenges enveloping Europe. We note that we include associate income in our EBITDA for this metric, although as the sales price for DEPA (and non-DEPA associates earnings) becomes clear we would start to adjust the metrics in a more granular manner. We apply current European peer average EV/EBITDA metrics to contribute towards our fair value, but note the wide range in metrics seen in the table above. On 7.8x, Hellenic is currently trading well below peers on 2018 P/E metrics (European peers are trading at 13.1x, while US companies are averaging 13.9x for 2018). This suggests upside is possible, though we note the large spread in P/E multiples, with Neste’s biofuels business driving above-average returns and its rating pushing up the average (it is 9.5x without Neste). The mature and commoditised nature of refining means that returns are rarely supernormal, tangible asset value is steady and intangible asset value is limited. As a result, we believe price to book multiples can be instructive. Analysis indicates the sector is currently trading at the high end of the 1-2x range seen over the last 20 years, which may suggest sentiment is currently high. For Hellenic specifically, it is trading at about 1x, well below the sector average. It is well within historical ranges. As with all refiners, Hellenic’s earnings are highly geared to refining margins, which can therefore produce large swings in cash flows. Since 2000, refiners have seen a number of cycles in the market, including the golden age of refining (2005-08) and a sustained downturn (2010-14). Margins in 2017 have been good, but as we outline elsewhere in the report, we see European oil products demand as static-to-down in the long term, challenging opportunities for growth and potentially putting pressure on profitability to force closures in less competitive refinery complexes. In assessing our long-term earnings forecasts, we look to long-term averages of profitability and a likely fall towards below cost of capital returns over time. Source: Edison Investment Research. Note: 2017 onwards are estimates. Source: Bloomberg, Edison Investment Research. Note: Peer group includes European refiners and large US players. We are cautious in the strength of our belief in CAPM-derived WACCs but take them as a guide to what investors look for. 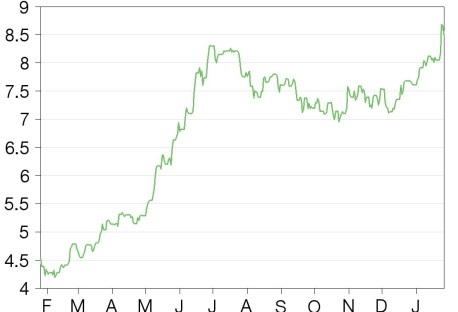 As can be seen in the charts, the industry has seen WACCs as low as 7% and as high as 10.5% and currently trades on c 8%. A purely mechanistic application of CAPM implies a current WACC for Hellenic of 7.5%, which we believe is unrealistic given peer WACCs, and its lower EV/EBITDA and P/E multiples vs peers but broadly consistent dividend yield. We use an 8% discount rate and a terminal growth rate of -0.5%, blending the 0% growth expected in Mediterranean economies and the 1% decline expected in wider European demand estimates. We have also taken the opportunity to review the DCF approach historically, applying CAPM-generated WACCs to true historical earnings over time (a 20/20 hindsight approach for historicals and a reversion towards cost of capital returns over time from 2022 onwards). This gives us a view on how the market viewed shorter-term earnings peaks and troughs vs long-term value. Source: Edison Investment Research, Bloomberg. Note: NPV standard approach denotes using a fixed 8% WACC, the “perfect hindsight” uses CAPM-derived WACCs at the time. This indicates that the market takes material interest in short-term earnings, often sizeably mis-valuing shares in times of feast or famine (vs a DCF approach). This approach indicates that sizeable returns could have been made by shorting the shares in 2006-10, and buying them again in 2014 as the margins returned from the doldrums. We have also examined dividend yields as a comparison, although we do not see refinery businesses as specifically targeted by income funds given potential volatility. We are comfortable, however, that ELPE can continue to afford good dividend payout. Indeed, at the 9M17 results, management suggested that a 5-7% dividend yield “would be in the right direction”, suggesting that a dividend payout of €0.37-0.52/share (using the share price on that day and in our forecasts). We model a full year dividend of €0.35/share growing to €0.40/share in 2019e. In an effort to apply other illustrative methods, we have also used a version of the Gordon growth model to estimate the value of operating assets. Two approaches have been employed: using current EBIT and returns on capital at a WACC of 8%, and using a more historically based return on capital (lower than 6%), producing a wide range. We model a refining EBITDA in 2018 of €563m, based on an average refining margin of $10.6/bbl. If the refining margin were to increase by $1/bbl, refining EBITDA would increase to €662m, or by around 18% (corresponding to a 13% increase in group EBITDA). Marketing has contributed around 15% of company EBITDA and earnings have been more stable. 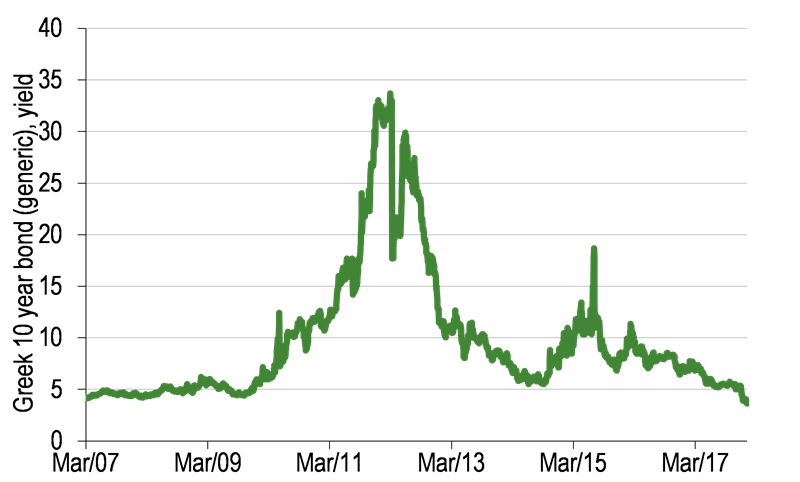 Petrochemicals contribute 15% of EBITDA but, typically for this industry, exhibit more earnings volatility. We are broadly in line with consensus estimates in 2018 EBITDA in 2018 but 9% above in 2019 as we perhaps see a greater uptick in refining margins due to the planned 2020 sulphur regulations. Our net income estimates are above consensus as we see debt being paid down and effective interest rates falling, resulting in lower finance costs. We also note we see higher depreciation charges over the years than consensus, helping to push down taxes, and increasing overall cash flow. We note that small changes in refining margins can result in large changes to EBITDA, so a 5-10% variance vs consensus on EBITDA is not particularly striking in our view. Source: Bloomberg, Edison Investment Research. Note: Consensus as at 26 January 2018. The fall of Brent prices from $100/bbl to $30/bbl in 2014/15 generated losses of €484m in 2014 (and €301m in 2015). While a price crash is not likely in the near future, the substantial cash movements possible in periods with swings in margins (and due to inventory effects) mean that the company is prudent to keep substantial cash resources on hand. It aims to keep around 20% of gross debt as cash. However, the company has no plans for any major capital projects (above maintenance capex), so has the potential to generate significant free cash flow in coming years if refining margins remain supportive. As a result, management will need to choose how best to deploy this excess cash. Projects at the refineries may be an option, but given the low returns that refining has historically delivered, it may decide that growth in other areas (renewables, marketing, E&P and oil products trading) may be better choices. Alternatively, paying down debt or paying higher dividends is also possible. The underlying profitability of the refinery is driven by the additional value of the processed products over the crude costs. However, the prices of crudes and products consistently move over time resulting in gains (or losses) from market movements that are nothing to do with the ability of the business to generate cash flows. Refineries exclude these market movements (inventory gains/losses) from adjusted results, but these can be movements large enough to have a material effect on quarterly cash movements and liquidity. It is therefore crucial to get a handle on the possible affect. We look at quarterly movements over the last eight years to form an opinion on future movements (as our oil price assumptions consistently increase over the forecast period). Source: ELPE, Edison Investment Research. Note: Different symbols represent the different quarters over time (Q1-Q4). While there is clearly a positive correlation, the error in any estimates can be large in absolute terms; for example a c $5/bbl move in average oil price over a quarter has generated gains/losses of between €0-100m (vs average quarterly adjusted refinery EBITDA of €89m since 2008 and €99m since 2013). This will be due to the timing of crude purchases and product sales (of Hellenic’s 42mmbbl of storage capacity) during the period and is not something we believe can be more finely tuned. The company plans no further refinery upgrades, and consequently we do not expect any significant additional capital investment in the forecast period. Refinery maintenance cycles are every four years, and maintenance capex of €100-150m across the business per year is well within cash flow. ELPE has generated post-capex cash flow of €200m pa in 2012-16 on average (on a reported basis). On an inventory-adjusted basis, this is rises to €400m pa. The weakening of the euro against the dollar from 2015-17 (from 0.75 to 0.9) has helped Hellenic materially (and every other European refiner). Refining is a US dollar business and so lower costs in US terms have benefited earnings (and cushioned the poor refining environment in 2011-14). We calculate an average impact (2015-17) of around $85m pa on a pre-tax basis. Hellenic is well capitalised and held €850m in cash as of September 2017. Gross debt of €2,665m is affordable in the current environment with 2017 interest cover (EBIT/interest expense) of 3.7x in Q317. The net debt to EBITDA ratio of 2.2x is within the company target of 2.0-2.5x (though we forecast it to fall to below 2x in 2018). Gross debt peaked in Q116 at €3.674bn but has fallen markedly in 2016 and 2017 as the company paid off over €600m of debt driven by strong cash flow generation across the group. The average interest rate over the gross debt has averaged 6.5% over the last eight quarters, but has been falling as the most expensive bonds (an 8%, €500m Eurobond) were paid off in May 2017 – the average rate in Q317 was 6%. 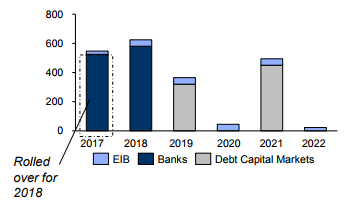 Two bonds (2019, €325m, 5.25% rate and a 2021, €450m, 4.875%) remain on public markets with the rest of the debt sitting with banks. This implies the average rate across the bank debt is 6.6% (inclusive of fees and amortisation). 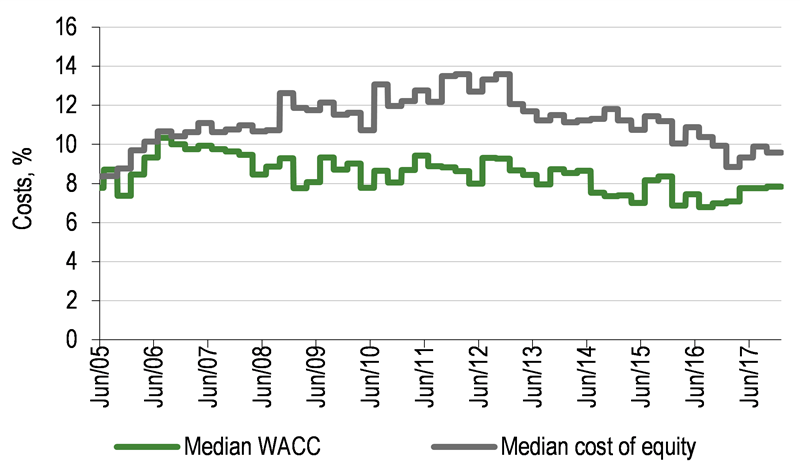 We note the cash cost of the debt is c 6%, across the last three quarters. The yield to maturity of the existing Hellenic bonds is just over 3.2%, suggesting that any new debt issued in the near term could reduce finance costs notably (by around 50%). We expect the company to refinance its €325m debt (maturing 4 July 2019), marginally reducing its financing burden at that time (for example, if we assume the coupon falls from 5.25% to 3.5%, the annual coupon would fall €6m per year [vs total current interest expense of c €172m]). Source: Bloomberg, Edison Investment Research. Note: The thicker dark green and grey lines are current bonds. Other lines are no longer trading. ELPE sources its crudes from numerous sources, including the Middle East. As a result, it had a relationship with Iran in 2012 when sanctions were put in place. This meant it was not able to pay the outstanding incurred payables to Iran, which are still on its books. As soon as international sanctions were lifted, Hellenic entered into an agreement with the National Iranian Oil Company for the reinstatement of commercial relationship and the gradual settlement of the payables. According to management, net payables as at the end of Q417 will likely stand at 3-4% of capital employed. Majority Greece, other revenues from the Mediterranean region. Efstathios Tsotsoros is a professor at the Panteion University in Economic Development and Social Transformation. He has extensive experience in management positions in public and private sectors as well as in local government. He has been director of PPC, board member and CEO of the Business Reconstruction Organization, vice president and general manager of the Athens Regulatory Plan and Environmental Protection Organization, board member and CEO of various companies in the private sector and founder, chairman and CEO of the Broadcasting Group Alpha. He was also advisor to the minister of energy, to the Athens mayor and to the president of the Greek Technical Chamber and he has also occupied the post of chairman of the National Committee of Programme Agreements and Development Contracts. Grigorios Stergioulis is a trained chemical engineer and holds an MSc in advanced integrated design. He has worked at Hellenic Petroleum since 1984 in various roles including as co-ordinator of the Elefsina refinery upgrading project. He has published technical publications in matters of automation, production computing systems and production optimisation and advanced control systems. He is the author of the book The Oil Market in South East Europe, which was published by the South East Europe Energy Institute and the General Trade Union of Greece. He has participated in many conferences as a speaker. In May 2015 he was appointed CEO of Hellenic Petroleum SA. Andreas Shiamishis holds an economics degree and is a fellow (FCA) member of the Institute of Chartered Accountants in England and Wales. His previous roles include positions at KPMG and Diageo. From 2000 to 2002 he worked as CFO at LEVENTIS Group and took over as chief financial and IT officer at Petrola Hellas in 2003. After the merger of Petrola Hellas with Hellenic Petroleum, in 2004 he took over as CFO. He is a member of the Hellenic Chamber and of the Corporate Finance Faculty of the ICAEW. Copyright 2018 Edison Investment Research Limited. All rights reserved. This report has been commissioned by Hellenic Petroleum and prepared and issued by Edison for publication globally. All information used in the publication of this report has been compiled from publicly available sources that are believed to be reliable, however we do not guarantee the accuracy or completeness of this report. Opinions contained in this report represent those of the research department of Edison at the time of publication. The securities described in the Investment Research may not be eligible for sale in all jurisdictions or to certain categories of investors. This research is issued in Australia by Edison Investment Research Pty Ltd (Corporate Authorised Representative (1252501) of Myonlineadvisers Pty Ltd (AFSL: 427484)) and any access to it, is intended only for "wholesale clients" within the meaning of the Corporations Act 2001 of Australia. The Investment Research is distributed in the United States by Edison US to major US institutional investors only. Edison US is registered as an investment adviser with the Securities and Exchange Commission. Edison US relies upon the "publishers' exclusion" from the definition of investment adviser under Section 202(a)(11) of the Investment Advisers Act of 1940 and corresponding state securities laws. As such, Edison does not offer or provide personalised advice. We publish information about companies in which we believe our readers may be interested and this information reflects our sincere opinions. The information that we provide or that is derived from our website is not intended to be, and should not be construed in any manner whatsoever as, personalised advice. Also, our website and the information provided by us should not be construed by any subscriber or prospective subscriber as Edison’s solicitation to effect, or attempt to effect, any transaction in a security. The research in this document is intended for New Zealand resident professional financial advisers or brokers (for use in their roles as financial advisers or brokers) and habitual investors who are “wholesale clients” for the purpose of the Financial Advisers Act 2008 (FAA) (as described in sections 5(c) (1)(a), (b) and (c) of the FAA). This is not a solicitation or inducement to buy, sell, subscribe, or underwrite any securities mentioned or in the topic of this document. This document is provided for information purposes only and should not be construed as an offer or solicitation for investment in any securities mentioned or in the topic of this document. A marketing communication under FCA Rules, this document has not been prepared in accordance with the legal requirements designed to promote the independence of investment research and is not subject to any prohibition on dealing ahead of the dissemination of investment research. Edison has a restrictive policy relating to personal dealing. Edison Group does not conduct any investment business and, accordingly, does not itself hold any positions in the securities mentioned in this report. However, the respective directors, officers, employees and contractors of Edison may have a position in any or related securities mentioned in this report. Edison or its affiliates may perform services or solicit business from any of the companies mentioned in this report. The value of securities mentioned in this report can fall as well as rise and are subject to large and sudden swings. In addition it may be difficult or not possible to buy, sell or obtain accurate information about the value of securities mentioned in this report. Past performance is not necessarily a guide to future performance. Forward-looking information or statements in this report contain information that is based on assumptions, forecasts of future results, estimates of amounts not yet determinable, and therefore involve known and unknown risks, uncertainties and other factors which may cause the actual results, performance or achievements of their subject matter to be materially different from current expectations. For the purpose of the FAA, the content of this report is of a general nature, is intended as a source of general information only and is not intended to constitute a recommendation or opinion in relation to acquiring or disposing (including refraining from acquiring or disposing) of securities. The distribution of this document is not a “personalised service” and, to the extent that it contains any financial advice, is intended only as a “class service” provided by Edison within the meaning of the FAA (ie without taking into account the particular financial situation or goals of any person). As such, it should not be relied upon in making an investment decision. To the maximum extent permitted by law, Edison, its affiliates and contractors, and their respective directors, officers and employees will not be liable for any loss or damage arising as a result of reliance being placed on any of the information contained in this report and do not guarantee the returns on investments in the products discussed in this publication. FTSE International Limited (“FTSE”) © FTSE 2018. “FTSE®” is a trade mark of the London Stock Exchange Group companies and is used by FTSE International Limited under license. All rights in the FTSE indices and/or FTSE ratings vest in FTSE and/or its licensors. Neither FTSE nor its licensors accept any liability for any errors or omissions in the FTSE indices and/or FTSE ratings or underlying data. No further distribution of FTSE Data is permitted without FTSE’s express written consent.